We've been buying our milk from local dairies and the milk is the old-fashioned non-homogenized-cream-on-top-in-the-returnable-glass-bottle milk. This milk is noticeably richer in its mouth-feel and the flavor is an astounding leap from the cardboard carton you get from your supermarket. This milk is still alive, an almost fleshy liquid with substance and body. As wonderful as this is, this, ah, aliveness comes at a cost -- the milk sours fairly quickly. It goes "bad" but it is not spoiled, it's just sour. The lactose (milk sugar) has been consumed by the wee beasties and has been turned into lactic acid. In other words, it has been fermented. When it reaches this state, you can set it out on the counter until it begins to get "chunky," and then line a colander or sieve with cheese cloth, pour the glop in and save the forming curds by tying the corners of the cloth together to make a satchel and allow the whey to drain off. The results that are left in the cheese cloth is cottage cheese. You know what to do with that, right? Mix the dry ingredients together. Put the cold shortening into the flour mix and then using a pastry knife, a pair of knives or your hands, mix the flour and fat until you get a grainy mixture and the fat is cut up to pea sized chunks. You don't want to overwork fat and melt it, you want it cold. Make a well in the center of the mix and add the sour milk and stir until you've combined the milk and flour into a sticky dough. Flour a work surface, a rolling pin and your hands well and take the dough and drop on your work surface. Work some flour into the dough by gently kneading until it gets a soft -- don't handle it too much. Roll it out to about a 1/2 inch in thickness and fold over on itself, turn it 90 degrees and roll it out until it's again 1/2 inch thick. Fold and repeat a couple more times. On the last time, fold it on itself and leave it. Now you can cut it with a biscuit cutter or I just square up the dough and cut six square biscuits to avoid waste. 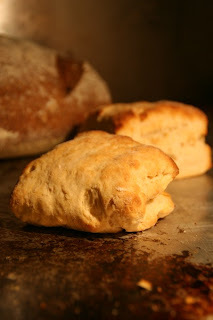 Place biscuits on a baking sheet and bake for 8-10 minutes until brown. These were the best biscuits I've ever had. What a joy it was coming home after work last night to a bunch of beautiful bisquits and a bowl of lentil soup. Just made these--fabulous! I didn't have lard, so used butter. Also, I have one kid that pines for dumplings, so I did some as dumplings and they were equally as fabulous. Thank you!